Patterson's post on gun violence includes an image of a street sign proclaiming that "Real Men Use Fists" with a slash through a revolver that made me think of firearm use by samurai during feudal Japan. When relative peace finally emerged during the Tokugawa period (1603 - 1868) firearm use had come to be seen as ignoble. Maybe "real men" of this time didn't like to use guns, but the Way of The Sword was held in high regard. Budo culture now took root and swordfighting schools flourished. Kenjutsu skills were honed not primarily for combat, but as a means to develop character and inner self-control. 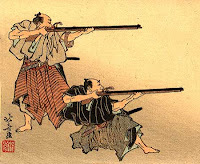 Two major treatises were written during this period: The Book of Five Rings by Miyamoto Musashi, and The Life-Giving Sword by Yagyu Munenori, both of which delve into philosophy, psychology, and combat strategy (heiho) while giving little regard to any technical explanations. Swords presumably cannot inflict the mass harm that a sidearm can, let alone an assault rifle. This didn't stop Sokaku Takeda from downing a group of Japanese laborers with his sword following a verbal altercation in the late nineteenth century. After he was acquitted, Takeda wised up and focused his efforts on the weaponless art of aikijujutsu. In Western lore, the sword was the weapon of choice for the duel before pistols became fashionable. A pre-presidential Abraham Lincoln was challenged to a saber fight that he deftly wiggled out of*. A younger Lincoln, however, did manage to compete in a number of no-holds barred grappling matches†, none of which ever resulted in a falality. A while back I saw a review on a book describing actual swordfighting techniques called Street Sword: Practical Use of the Long Blade for Self-Defense. I haven't read it, nor do I plan to. For now, I'll just stick to hand-to-hand combat. Somehow I feel safer that way. * Steven Pinker 2011. The Better Angels Of Our Nature: Why Violence has Declined. The Penguin Group. † Glenn J. Morris, Ph.D. 1998. Martial Arts Madness. North Atlantic Books.